If you’re looking to today’s post for driving data and efficiency tips from my travels, sorry, but you won’t find them. Today, I’m talking about sparking EV interest in our next generation. 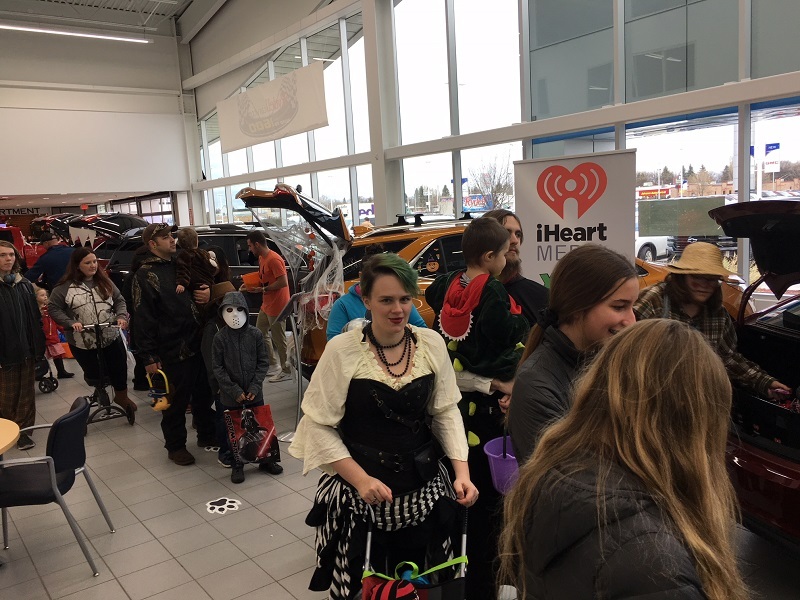 I used the spookiest day of the year to show the Bolt to two equally awesome young audiences – high school sophomores checking out professional prospects in our region, and a herd of the most adorable trick-or-treaters I’ve ever seen. 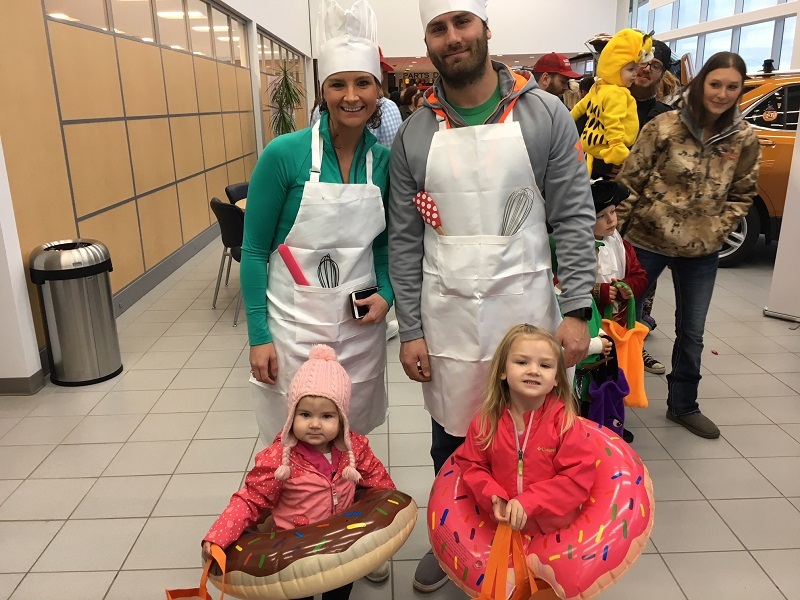 I started Halloween at the Northern Valley Career Expo, an incredible annual event hosted at the Alerus Center in Grand Forks. The expo brings in hundreds of tenth graders from more than 30 high schools from the Red River Valley and beyond. 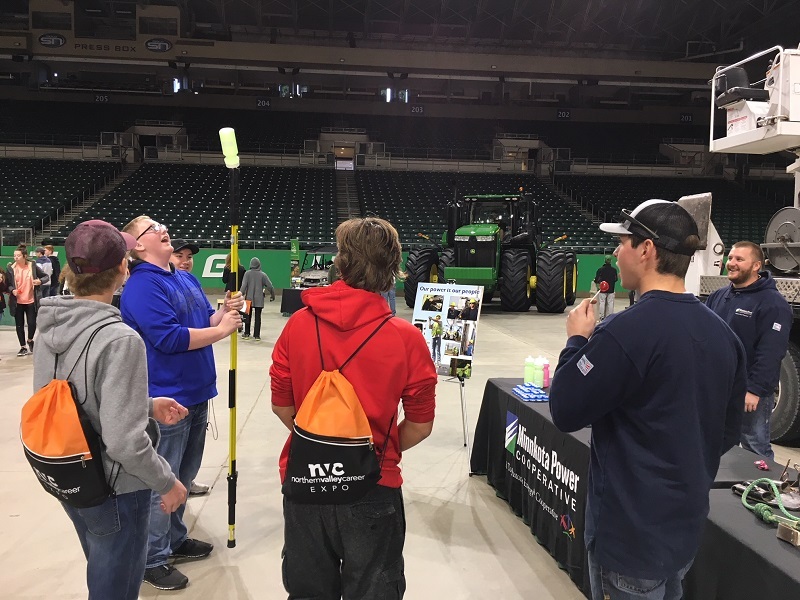 They spend either the morning or the afternoon mingling with area colleges, organizations and businesses from every industry to learn about the career opportunities they can find right here in North Dakota and Minnesota. Minnkota line workers Luke Boman and Matt Setter (far right) used games to show how their equipment works and chatted with dozens of students about careers in the energy industry. I joined a team of staff and line workers to explain the array of interests you can pursue at Minnkota – engineering, IT, human resources, legal, telecommunications, and so on and so on. Many were intrigued that a power company could offer up so much. 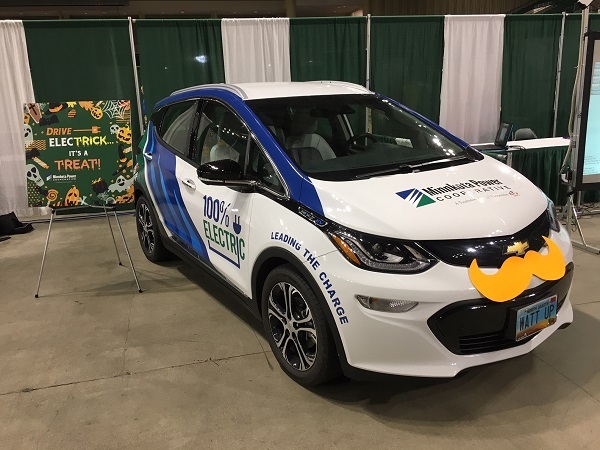 I got the chance to talk about what I do as a communications specialist, using the mustache-clad Bolt (I mean, it was Halloween) as an example of my education and outreach role. The students ended up asking more questions about the car than about my job, and I was completely okay with that. This was a dual-purpose day! 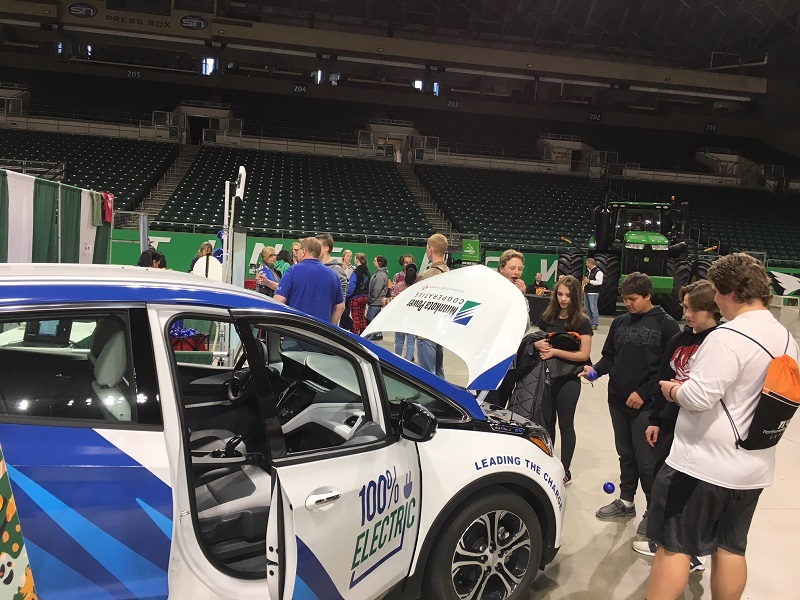 High school sophomores are often unsure of their plans after graduation, so it was fun to talk with them about both charging up their resumes and charging up a car. 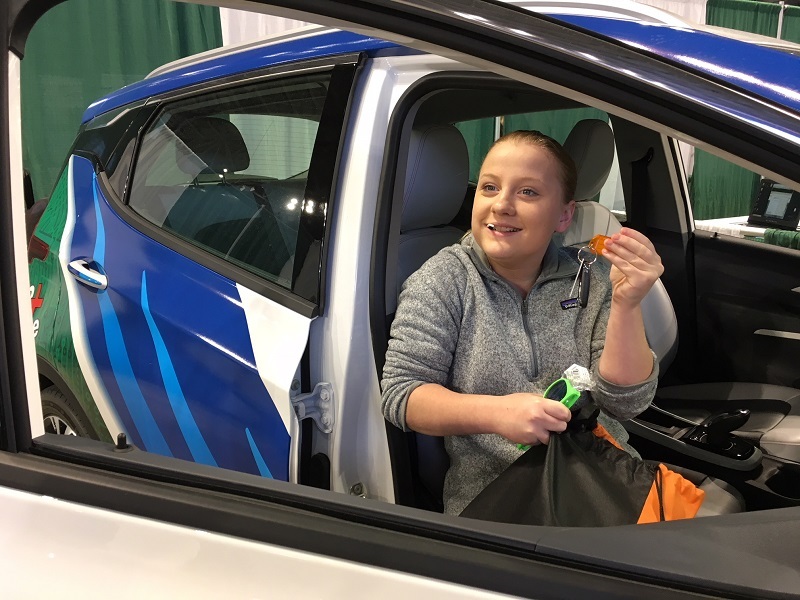 There were a lot of giveaways and swag at the expo, but the car was one thing I wasn't going to let an attendee take home. Sorry! By mid-afternoon it was time to switch gears from career preparation to candy distribution. I packed up the Bolt and headed straight to Rydell Cars, which was hosting an annual Trunk-or-Treat event for the community. 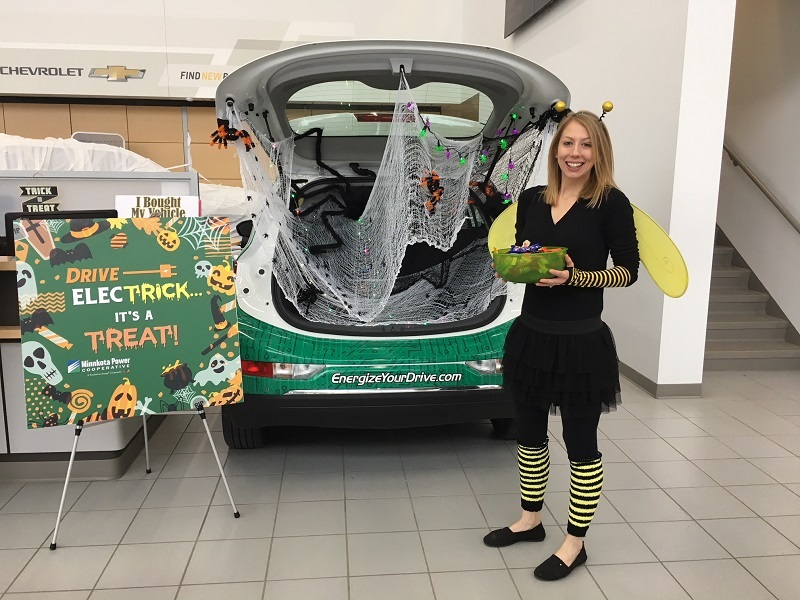 Rydell asked Minnkota, and many other area businesses, to “sponsor a trunk” on its showroom floor to decorate and use to hand out candy to more than 1,200 little ghosts and goblins. I requested to bring the Bolt to deck out instead of one of the car canvases that was provided, and they had no problem with that. Thanks, Rydell! I was pretty proud of my trunk decorating skills. I thought it found a nice balance between spooky and spunky. There was a steady line of trick-or-treaters over the entire course of the two-hour Trunk-or-Treat event. I never stopped handing out candy, and my face was tired from smiling and laughing the whole time. This was, by far, my favorite family costume of the night. Doughnut chefs and their creations – I love it! Getting EV technology in front of the youths who will be making a decision to buy one in the next decade or so. Filling my bloodstream with sugar.